Though many pest problems decrease in Fall with decreasing temperatures and risks of contamination from outside, Powdery Mildew (PM) problems tends to increase this time of year. As vents close and temperatures drop, episodes of leaf wetness can occur, setting up the right conditions for this pest. Plants especially susceptible to PM include begonia, chrysanthemum, gerbera, roses, kalanchoe, snapdragons and others. On most plants, powdery mildew appears as white felt-like spots, but in some plants, only reddish discoloration appears where the infection occurred. Conidia (spores) of PM need a RH of 95% (or a near-zero vapour pressure deficit) for more than 3–4 hours to germinate and penetrate plant cells. Thus, leaf wetness episodes promote fungal development. Temperature, light, and air movement – which can all affect the occurrence and duration of leaf wetness – all influence the severity and spread of PM. Because of these interrelated environmental factors, it’s important to use an integrated approach. 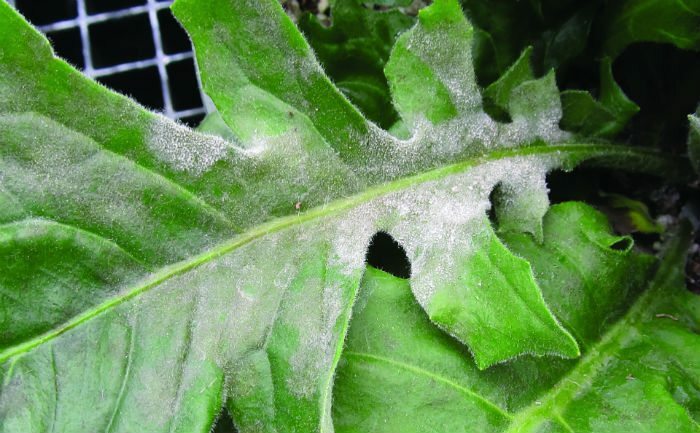 Powdery mildew typically won’t cause plant death, because it needs a living host. Practice good cleanliness, walk through regularly and rogue all infected plants. If that isn’t possible, try pruning out infected tissue. Ensure any infected tissue is bagged as you go to avoid releasing new spores along your route to the disposal bin. Keep the air in the greenhouse circulating. If you make the greenhouse environment less inviting for the fungi, they can’t have as much fun, guys! (See what I did there?). Proper venting in the early morning will help to to keep the RH down, and make the greenhouse a less inviting place for spores. Ensure plants are adequately spaced so there is no overlapping tissue which creates warm, dark spaces where spores love to multiply. Keep water off the foliage. Consider drip lines or sub-irrigation for particularly susceptible crop types. Overhead sprinkling actually may reduce the spread of powdery mildew, because it washes spores off the plant, but remember – standing water created the problem in the first place. The best time to irrigate is on a sunny morning, when plants can dry quickly, reducing the risk for infection. There is evidence to suggest that over fertilization can contribute to infections, so ensure that your nitrogen rates are not excessive, and consider using slow release fertilizer if you can. Besides the cultural controls discussed above, here are several microbial fungicides that offer effective preventative protection against powdery mildew. These include Cease (a strain of Bacillus subtillis), Actinovate (Streptomyces Iydicus) and Cyclone (fermentation products of Lactobacillus casei). However, for these products to be effective, thorough spray coverage is needed, and applications usually need to be repeated every 7-10 days (see labels for specifics). Once visible PM develops, these products likely need to be combined with more conventional fungicides. There are a ton of chemical products registered for Powdery Mildew (see OMAFRA’s Pub 370, pg. 141). A popular product is the use of Vaporized Sulphur, which can be burned at night when employees are absent and has a limited re-entry time. Sulphur pots are commonly used in greenhouses for control of all species of powdery mildew. Make sure not to overfill the pot. Although highly effective for controlling PM, it’s important to note that sulphur pots are thought to potentially interfere with biological control programs. Reports show it’s especially hard on Encarsia, Feltiella, Aphidoletes and Diglyphus. To minimize effects on natural enemies, you can burn at a lower rate (e.g. no more than 12 hours per week, or 3 nights of 4 hours of burning) which will still prevent PM, but limits effects on bios. You’ll likely need to play around with the burn time to find a balance that works for YOUR IPM program in YOUR greenhouse. 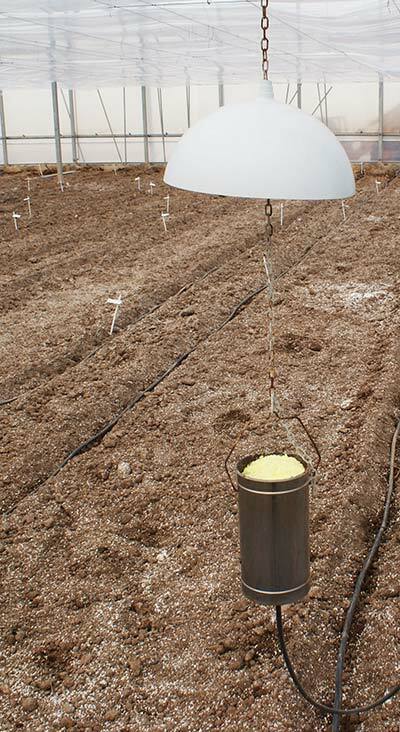 In almost all crops, a sufficient density is 1 to 1.5 pots per 1000 square meters (though highly susceptible crops, like roses, may require more). Other good choices for PM control are spray applications of MilStop (potassium bicarbonate), Nova (myclobutanil) or Compass (trifloxystrobin). The latter two have systemic properties, and thus can act preventatively as well. Though most fungicides for PM do work on more than one causative agent of this disease, certain chemicals may preform better on some species than others. For example, Compass is registered for Erysiphe azaleae and Spaerotheca pannosa, specifically, which a product like Pristine is only registered for Erysiphe polygoni. Thus, consider getting your PM outbreak identified to species through the Guelph Pest Diagnostic Clinic if your chosen strategy doesn’t seem to be working. That’s it for our post on Powdery Mildew! However, there’s a few updates to our last post on predatory mites, courtesy of Ronald Valentin (BioLine), Sebastian Jacob (Biobest) and Judy Colley (Plant Products) who all had good information to add. I strongly encourage you to re-read it. (Post joint written by Chevonne Carlow and Sarah Jandricic. Special thanks to Sebastian Jacob, Ronald Valentin and Colin Ashbee for their input on this post).